Votes Determined Public’s Favorites for Customer Service Excellence. 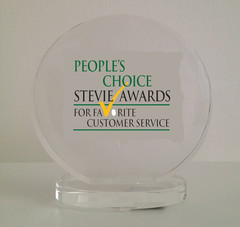 The People's Choice Stevie Award for Favorite Customer Service crystal trophy. More than 149,000 votes were cast in this year's public vote.